Had a great stay during our Japan tour at all of the Japanese and Western hotels. The food was also very good during the tour. At every hotel the staff was kind and polite. All in all, this Japan tour was a good excursion. We were able to learn a lot during our Japan tour and I truly appreciate the country of Japan and its people. Wish tour itinerary was not so rigid. Thank you! Choice of hotels was excellent - some western and some western and some Japanese. Staff at the Japanese hotels were very cordial and attentive. The staff showed their appreciation bowing and welcoming us as well as when we left. Again, Japanese meals prepared at the Japanese (Eastern Style) hotels were well thought out. Showed great presentation and went through a lot of preparation. Buffets were delicious, but not as good. Our tour guide between good and very good. She demonstrated a good knowledge of subjects we visited. However, fiecding a few of our questions - she hesitated. She exhibited a good control of our group. Seemed to be unbothered by traffic condition and crowd control situation. Enjoyed a majority of sights visited, although because of large crowds of visitors, some sites should be eliminated. We wasted more time in traffic and fighting large number of visitors (Chinese Tours). 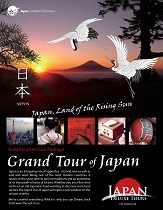 Maybe for more value-added attractions, Japan Deluxe Tours could visit more exclusive spots.